Phantom movie review: Saif Ali Khan and Katrina Kaif’s latest tells a gripping tale! Kabir Khan ensures that his audiences stay on the edge of the seat. 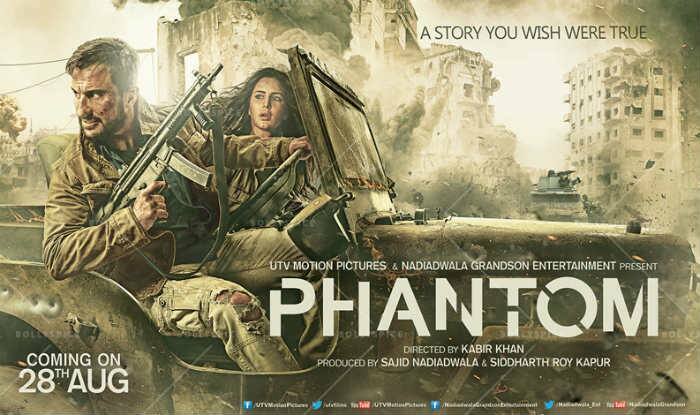 With his latest offering director Kabir Khan ensures that his audiences stay on the edge of the seat, absolutely resolutely, throughout the gripping watch (that Phantom is). He doesn’t take too long to build a concrete narrative and keeps the momentum going right till the end credits start rolling. And that makes Phantom a compelling watch indeed! Saif Ali Khan’s effortless swagger, his unmatched style, the sincerity of his performance coupled with his suaveness is taped rightfully into to be able to flesh out a character that stays with you long after you have left the movie hall. If you like espionage movies with not-a-minute-allowed-to-think-otherwise storyline, you just can’t afford to miss Phantom! Also Read: Kabir Khan takes his Phantom from Kashmir to Canada: Take a look how! Loosely based on Hussain Zaidi’s book Mumbai Avengers, Kabir Khan’s Phantom revolves around a hypothetical premise. If America can achieve justice by bumping off Osama Bin Laden in a secret operation at his hideout in Pakistan, why can’t India follow suit and bring the masterminds of the deadly Mumbai attacks to book. But the dictate given is very precise and needs to be obeyed to the letter: Only those who are involved in orchestrating the ghastly attacks need to be wiped out, without causing any civilian causalities in the neighbouring nation. In comes our go-to-man Daniel Khan (played by Saifu) Also Read: Will Kabir Khan’s Phantom be as successful as Bajrangi Bhaijaan? Khan has been roped in by RAW for a deadly mission to kill the perpetrators of 26/11 attacks. He joins forces with Nawaz (Katrina Kaif), A former RAW agent-turned-arms supplier. Will they go for the kill and accomplish their mission? After the success of Salman Khan starrer Bajrangi Bhaijaan filmmaker Kabir Khan has decided to roll his dice with more diligence and elevate his craft a couple of notches with this movie. Khan keeps you glued to the seat as he keeps his narrative crisp, concise and taut. Not a frame is wasted and not for a moment would you get a chance to think about anything other than this cinematic treat dished out on the big screen. Bolstered with the razor sharp editing skills that put a seasoned surgeon to shame, excellent cinematography and commendable screenplay, Kabir Khan delivers a cinematic treat that entertain as well as thrill you. The movie is technically supreme too. A special mention here for the background score and the action sequences where the expertise employed is on par with the international standards. As far as performances are concerned Saif Ali Khan plays the revengeful (almost spiteful) agent with tremendous intensity. Katrina may not match up to his acting skills but delivers a fine performance. All in all, the two compliment each other beautiful to propel the story where both the performances as well as the performers are in sync with the gripping plot. Mohammad Zeeyshan Ayub scorches the screen with his screen presence and his stellar performance.